Serverless really shines for this use case, and hopefully this post makes it clear why. In a non-serverless paradigm, we have to pick something like express, we have to set up endpoints, we have to give your web server secured access to your database server, you have to deploy it, etc. In contrast, here we'll be able to create an API in a few button clicks, with minor modifications. Here’s the inspiration for this tutorial: I've been building a finder to search for new cocktails and grab random one. I originally started using ae public API but realized quickly that I found the contents limiting and wanted to shape my own. I’m going to use Azure for these examples but it is possible to accomplish what we're doing here with other cloud providers as well. 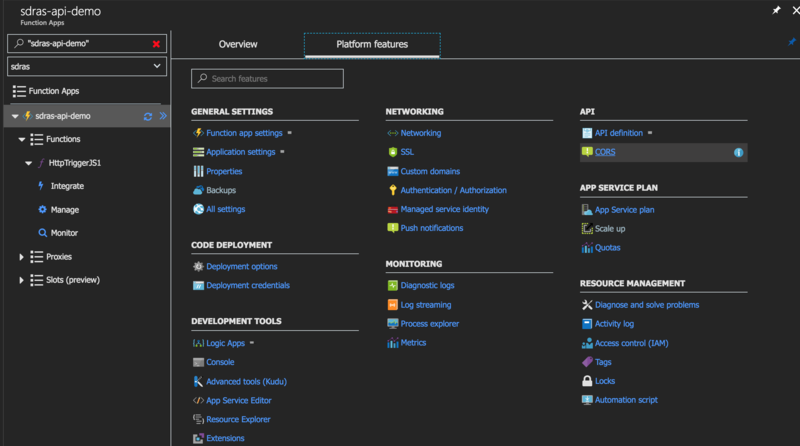 To get started, if you haven't already, create a free Azure trial account. 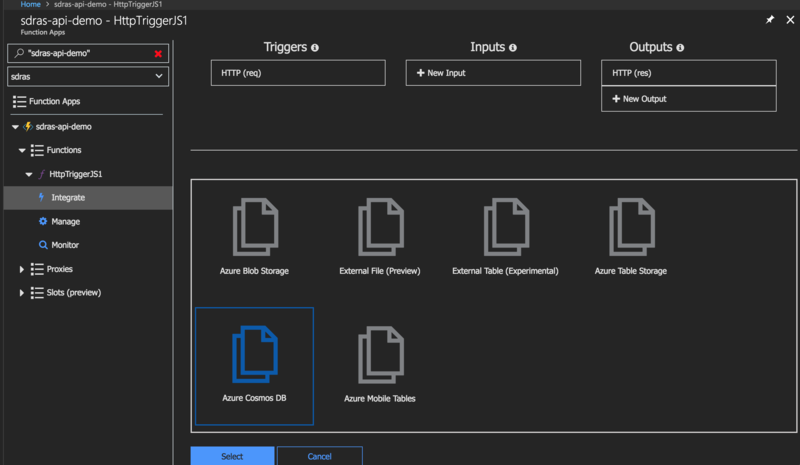 Then go to the portal: preview.portal.azure.com. Next, we'll hit the plus sign at the top left and select Serverless Function App from the list. We can then fill in the new name of our function and some options. 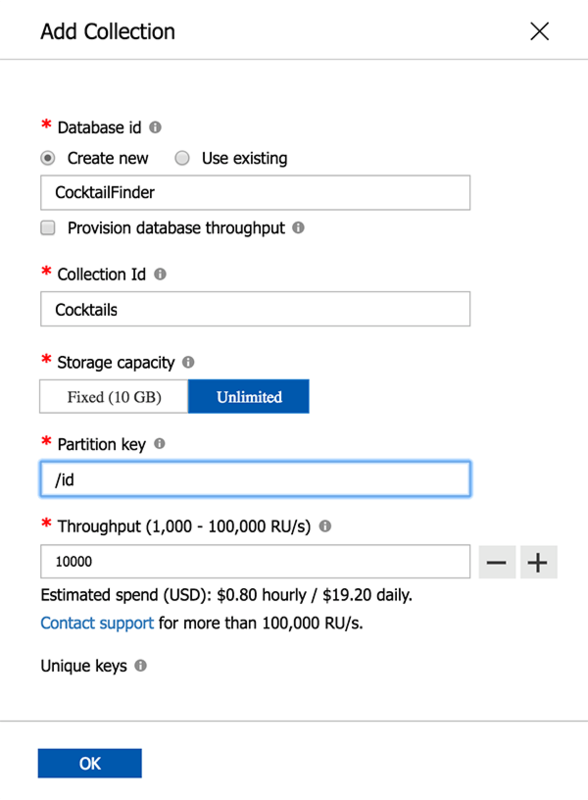 It will pick up our resource group, subscription, and create a storage account from defaults. It will also use the location data from the resource group. So, happily, it's pretty easy to populate the data. Change the authorization level to "Anonymous"
Change the allowed HTTP methods to "Selected Method"
There are a number of ways to store the data for our function. I wanted to use Cosmos because it has one-click integration, making for a pretty low-friction choice. Get a free account here. 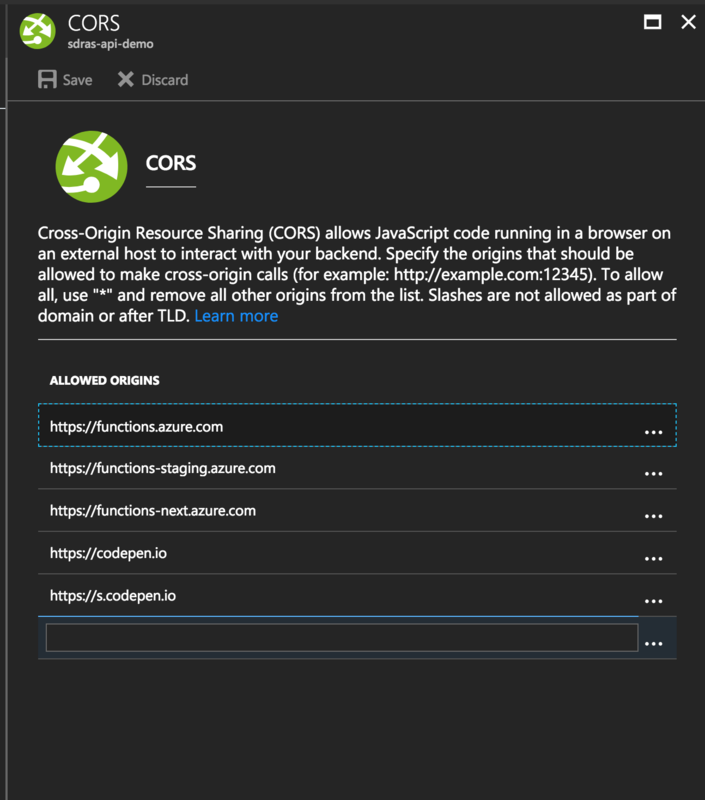 Once you're in the portal, we'll go to the plus sign in the top left to create a new service and this time select "CosmosDB." In this case, we chose the SQL version. We have a few options for how to create our documents in the database. We're merely making a small example for demo purposes, so we can manually create them by going to Data Explorer in the sidebar. In there, I made a database called CocktailFinder, a collection called Cocktails, and added each document. For our Partition Key, we'll use /id. In real practice, you’d probably either want to upload a JSON file by clicking the "Upload JSON" button or follow this article for how to create the files with the CLI. If we go back to our function in the portal and click Integrate in the sidebar again, there’s a middle column that called Inputs. Here, we can click on the plus that says "+ New Inputs" and a few options come up. We’ll click the CosmosDB option and "Create." Now to make sure the API is working and we can access it's data from an application, we’ll use an axios call. I have a really barebones CodePen implementation so that you can see how that might work. In Vue, we’re hooking into the created lifecycle method and making the GET request, in order to output the JSON data to the page. Thanks for your tutorial Sarah! How would you compared the learning curve and UI friendliness of Azure function against other services like AWS Lambda or Webtask? Curious to hear your thoughts. There’s a reason I choose to talk about them all the time of everything Azure has to offer. But definitely play with both and decide for yourself! I would also like to know how Azure functions compare with AWS Lambda. AWS Lambda and Microsoft functions are very similar on the surface, but as an overview Lambda functions are created as standalone elements with each program acts as a separate program and this extends to resource allocation. The memory provision is on a per function basis rather than an application group. Azure Functions are grouped in a per application basis. Functions allows a one click code monitoring via application insights but this is available via XRay on AWS but is a little more complex and this is also extended to better local debugging. Since Azure functions runtime is opensource (what else do you expect these days from Microsoft) then that means this will give you a “future proof” if Microsoft ever decides to exit or you want on host it in house or on your own containers the world is yours to explore. Great article Sarah, your writing style is far better than mine.